Last week, about a year after the Nepal earthquake struck, I received a powerful series of images from the nonprofit I donated to support recovery efforts. The very next day, tragedy struck Ecuador. As we did with Nepal, communities around the world once again mobilized and sent money, organized clothing and food drives, and once again started sending money, resources, and people to support recovery. I wonder if aid organizations will do better in Ecuador then they did in Nepal and Haiti… I wonder if we, as individuals, are thinking about how to give more effectively to solve systemic issues and support those suffering from tragedies. I’m worried that we’re not. 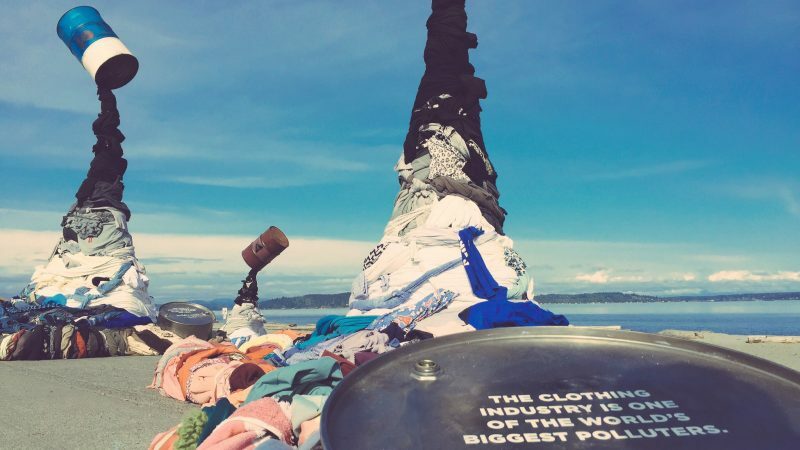 As this thought was being mulled over in my mind, I learned about a new initiative from Saver’s Value Village called “Rethink Reuse” – a stunning installation that was setup on Earth Day 2016 to educate people about the waste they are unknowingly creating in the simple act of buying and discarding clothes. The installation was a moving way to rethink the way we buy, use, and recycle clothes. At a deeper level, it created space to rethink the way we personally give and take on our planet — a very fitting thing to do on Earth Day. While the connection between your fashion buying habits and the earthquakes in Nepal and Ecuador seem a little disconnected at first, they share a common theme – we don’t think enough about the way we give. By understanding more about how we consume and dispose, maybe we can learn how to give better, too. Why focus on clothing? Because the clothing industry is one of the world’s biggest polluters, largely thanks to fast fashion companies like H&M. A simple cotton t-shirt needs 700 gallons of water to be produced. In the USA alone, over 10.5 Million TONS of clothing is thrown away every year – 95% of which is recyclable and could be diverted from landfills. While at the installation, I had the chance to speak with Saver’s VP of Recycling and Reuse, Tony Shumpert, to discuss ways that people can rethink their normal activities, and in doing so, become more responsible citizens of the world. How often do you buy new things you don’t really need? How often do you throw things away? How often do you volunteer your time and skills? You might think you need new clothes, but do you? As society considers sustainability and social responsibility to be increasingly important, does fast fashion make you look better, or just more selfish? Giving is the same. The latest charity backed by a famous celebrity does not mean it is the best. Replacing your charitable activities by only buying feel good or 1-for-1 brands can actually create more harm than good. You should be skeptical about new clothes just as you should be skeptical about the latest charity trends. While many clothing companies, like Patagonia, Levi’s, and Timberland, have emphasized building higher quality, sustainably sourced products that last longer and are easily recyclable, most are not. Newness is not a sign of quality. In our conversation, Tony was quick to point out that, of the 10,000 items that hit their store’s floors everyday, many products are from high quality brands and often brand new. Often time, tried and true is better than new, and used does not mean worn out. Charity is very similar. The latest nonprofit or cause might be high quality, but there is also a chance that it isn’t. It is important that you do your research. Organizations like Effective Altruism can help you decide which charities will help you reach your giving goals. Tony was adamant that it’s simple to start, “Start at Google with a simple search and then have a conversation with your friends and coworkers”. Just start small. The easiest thing you can do is search for ways to recycle clothes in your zipcode and you’ll see plenty of options. Once you know that, talk to your friends and coworkers about what they do, and what you can do together. You can improve your giving activities the same way. Pick a cause you care about, and do a search for organizations you can support. Research your options, and then talk to your friends and coworkers about where they give, and team up to extend the impact of your individual efforts. Change doesn’t have to be hard, but not changing is already painful for billions around the world. How will you #RethinkReuse?